Enriched with organic Shea butter, Hazel seed, and Olive fruit oils. Whamisa's Organic Flowers Lotion Original is a lightweight lotion that is enriched with organic Shea butter, Hazel seed, and Olive fruit oils. The formula uses botanical extracts from Aloe to replace water for extra hydration. Suitable for all skin types. Recommended for oily and combination skin. Apply in the mornings and at night on cleansed skin (after toning). Pat the product into skin until fully absorbed. Het smeert lekker dun op je gezicht, fijn voor de gecombineerde huid. 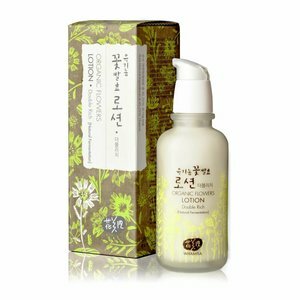 Enriched with Aloe Vera extract, Chrysanthemum extract. 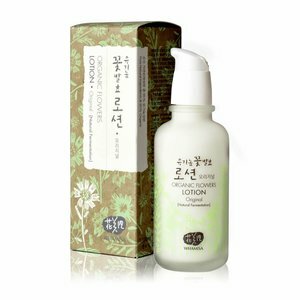 Whamisa's Organic Flowers Lotion Original is a lightweight lotion that is enriched with organic Shea butter, Hazel seed, and Olive fruit oils. The formula uses botanical extracts from Aloe to replace water for extra hydration. Suitable for all skin types. Contains 95% organic ingredients that help to firm and brighten the eye area. Enriched with organic Argan oil, Jojoba oil, and Shea butter. Enriched with Lotus flower, Citrus extracts and Galactomyces. Enriched with Chrysanthemum, Galactomyces, Rice, Cucumber, and Broccoli extracts.